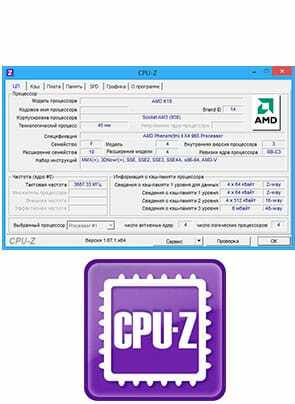 CPU-Z —это бесплатная программа, которая собирает и потом отображает сведения о компьютере: название и основные характеристики материнской платы, чипсет, данные наименовании и характеристиках процессора, количество оперативной памяти, тип памяти, тайминги, наименование и характеристики видеокарты, марку и версию BIOS и прочую информацию. Кроме данных о железе, CPU-Z предоставляет информацию об установленной операционной системе и DirectX. Все представленные данные можно смотреть как в самой программе, так и в созданном на их основе отчете, доступном в форматах .HTML и .TXT. Программа доступна в двух вариантах: для для 32-битных и 64-битных систем. Если вы не знаете, какая у вас система, устанавливайте 32-битную версию CPU-Z. Она будет корректно работать и на 32-битах, и на 64. Установите программу (она бесплатная и ключа не требует). Запустите. Дайте время CPU-Z проанализировать ваши устройства и на вкладках найдите интересующую вас информацию. Среди вкладок: ЦП (то есть центральный процессор), Кэш, Память (имеется в виду оперативная память), Плата (то есть материнская карта и BIOS), Графика (то есть видеокарта), SPD (чип оперативной памяти с информацией о частотах и задержках памяти), Тест и О программе. Great post but I was wanting to know if you could write a litte more on this topic? I'd be very thankful if you could elaborate a little bit more. Appreciate it! Woah! I'm really loving the template/theme of this website. It's simple, yet effective. A lot of times it's tough to get that "perfect balance" between superb usability and appearance. I must say that you've done a excellent job with this. Additionally, the blog loads very quick for me on Internet explorer. Outstanding Blog! Every weekend i used to visit this web page, as i wish for enjoyment, for the reason that this this web page conations in fact good funny stuff too. Regards. A lot of content. I read this paragraph fully regarding the comparison of hottest and earlier technologies, it's remarkable article. Staying with the Information World dominated mainly by the multidimensional involvement of the Internet, the Mentouri Constantine University is home to this space odyssey. In the event the updated presentation of its website, rich in themes and more provided in sections, offers all Algerian and universal Internet surfers an active relay where exchange relations develop for the good thing about knowledge, communication and communication. partnership in whose basic environment is the vast sphere of higher education and scientific research. The interface of this new version, presents a great richness on the university and environmental surroundings in which it is located, and also ergonomics and the user-friendliness of the portions composing the various webpages of this Website; it also offers graphical and interactive interfaces allowing communication between Internet users and the universe of the university. It also runs to information linking the university and its clinical and social partners. On top of that, we also want to make the production of Scientific and Technical Info one of the major missions of the university, a mission that is part of its dynamism and its educational and research activities. Finally, this contributions will have the worth of engaging our organization to participate actively in the act of dialogue and knowledge sharing. Why does CPU-Z misreport my memory module specification ? For example, my DDR2-800 is reported as DDR2-667.